a fun-filled fantasy adventure series for middle grade readers! In Book I, THE ROCK OF IVANORE, enchanter's apprentice Marcus Frye and five other boys set out on a dangerous journey to locate the Rock of Ivanore and bring it back to their village. In THE LAST ENCHANTER, months have passed since they succeeded in their quest. One of the boys, Kelvin, is living as royalty in Dokur, and Marcus is studying magic with Zyll. When Lord Fredric is murdered and Kelvin becomes king, the Enchanter Zyll and Marcus head for Dokur in hopes of protecting Kelvin from meeting the same fate, though it quickly becomes apparent that none of them are safe, and Marcus has had disturbing visions of Zyll's death. With the help of his old friends Clovis and Bryn, joined by new friend Lael, a feisty girl in search of her mother, Marcus uncovers a powerful secret that will change the course of his life forever. In addition to THE LAST ENCHANTER being released on OCTOBER 15th in hardback, THE ROCK OF IVANORE is also now available in paperback! Both titles can be purchased at bookstores nationwide and online at Barnes & Noble, Amazon, and Indiebound. They are available as E-books, too. To celebrate the release of her newest book, author Laurisa White Reyes is giving away a brand new 16 GB NOOK HD!!! Details on how to enter the giveaway can be found at the end of this post. In the meantime, please enjoy this excerpt from THE LAST ENCHANTER followed by an interview with the author, Laurisa White Reyes. A fun fantasy series with plenty of exciting twists. Marcus finds himself once again on a quest. This time it's to stop a plot to kill the new king, who happens to be Marcus's brother. But in the process he must avoid being killed himself and face new challenges not the least of which is a girl. Will his magical skills be enough to save him and his friends? And what about the dreams that seem so real? I really enjoyed this, but I do recommend you read the first book in the series first, because a lot of things that happen in this book are directly connected to what happens in the first book. Marcus is an appealing character with unique abilities that scare him, especially since there seem to be some serious side affects to his previous magical use. His relationship with Lael made me roll my eyes and snicker at times because while it was obvious to me what was going on, Marcus was clueless for most of the story. I found myself quite involved in the story as the action starts quite quickly which is great since most middle grade readers won't keep reading if the story doesn't draw them in immediately. I think most kids will enjoy the action and adventure of this story. I'm definitely looking forward to reading book 3. What books influenced you most when you were growing up? My favorite series for years was the TRIXIE BELDEN MYSTERIES. I still have the entire set of books in a box in my garage. Some of my other favorites included ROBINSON CRUSOE, OF MICE AND MEN, GONE WITH THE WIND, WUTHERING HEIGHTS and ROOTS. Heavy duty stuff for a kid, I know, but I loved them. Still do. As an adult I learned more about writing from Dan Brown (THE DAVINCI CODE, ANGELS & DEMONS) than anyone else. He is a master of suspense, every chapter a cliffhanger so that you just can’t put his books down. Period. And I love how he weaves multiple points of view together until they all collide at the end. I wish I could write like that. What gave you the idea for your book series The Celestine Chronicles? I’ve always enjoyed reading to my kids at night before they go to bed. When my oldest son was about 8 years old, he asked me to make up a story instead of read one. So I told him about an enchanter’s apprentice who botched his spells. Each night my son would tell me what he wanted to hear that night, whether it was dragons, or magic, or sword fighting, and I’d weave it into the story. Eventually I started writing it down. A year later I had a completed manuscript of THE ROCK OF IVANORE. I wrote THE LAST ENCHANTER two years later. I don't have a typical writing day. As a mom of five kids, I actually have very little time to write. Years ago I used to stay up late at night to write, but I now I try to wake up an hour before the kids do and get a little work done then. On a good day I might write 1,000 words -- the equivalent of about 5 printed pages. 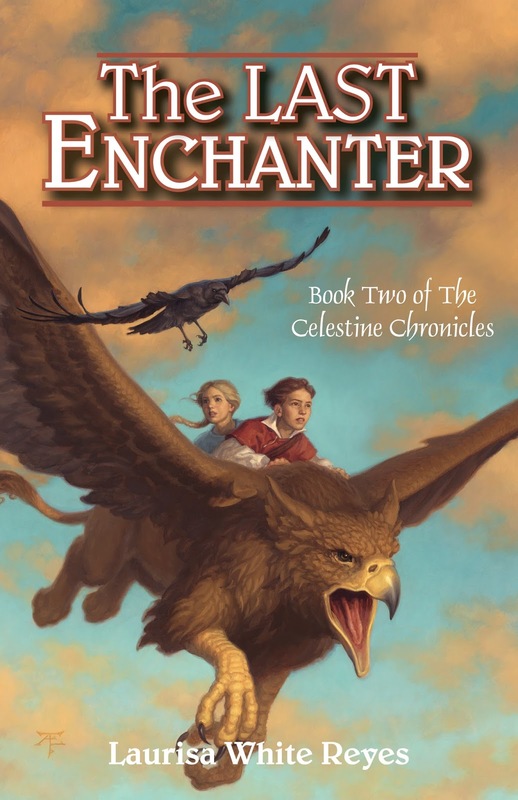 Who are your favorite characters in THE LAST ENCHANTER? That's a tough question. While I like all the characters (I wouldn't write a character I couldn't like) Lael is new to this book. She wasn't in Book I. Lael is Marcus's age but wasn't included in the original quest because she is a girl. She really proves herself, though. While the boys use swords and bows and arrows, Lael is adept with the sling. Also, Bryn (the Groc who parades around in the form of a little boy) is particularly fond of her. And any friend of Bryn is a friend of mine. Will there be a book III in The Celestine Chronicles? Yes. The Seer of the Guilde is tentatively slated for 2015. However, in the meantime, I am working on the parallel series called The Crystal Keeper, which chronicles Jayson's years in exile in Hestoria. Anyone interested in the story of Jayson and Ivanore will want to read it. 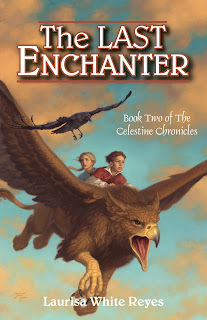 In the meantime, I hope everyone will enjoy THE LAST ENCHANTER. The winner will be chosen at random via Rafflecopter. To enter the giveaway, fill out the form below. This giveaway will end on November 6th.